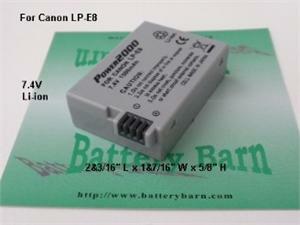 The battery is made by VidPro Inc. It has 1500 mAh capacity, 20% longer running time than Canon LPE8 battery. The replacement battery has the same dimensions as the original Canon battery- ( 2&3/16" L x 1&7/16" W x 5/8" H.) Your Canon charger will charge this Vidpro made battery.